A2-TYPE is a type foundry set up by the London based design studio A2/SW/HK. Established to release and distribute over a decade’s worth of specially crafted typefaces the foundry offers access to a unique collection of fonts. Launching in Autumn 2010 with a selection of 15 fonts specially created for print, screen and environment. 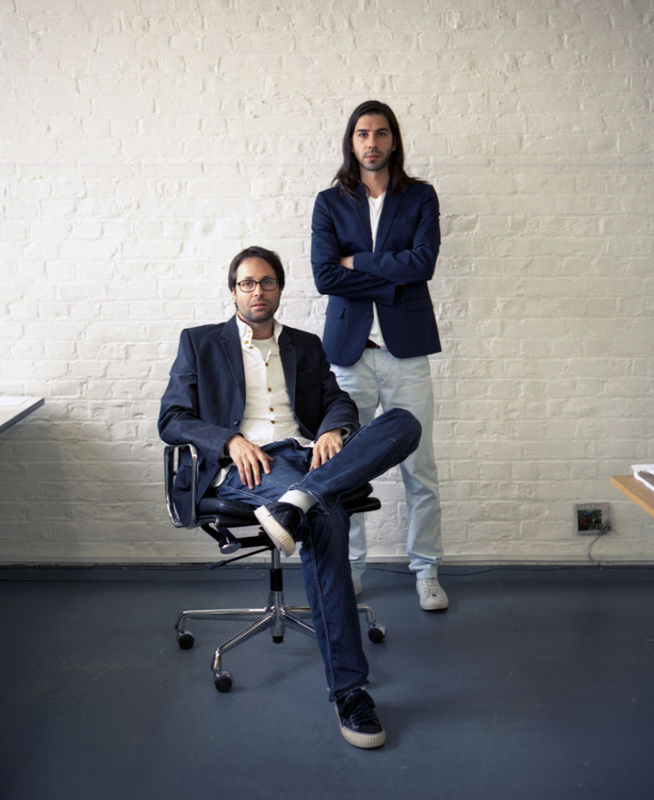 Scott and Henrik are members of Alliance Graphique Internationale, AGI. Read more. A Voyage around the shape of lettering to celebrate the Bicentenary of Giambattista Bodoni’s Manuale Tipografico. Exhibition curated by Silvana Amato, AGI Italy. A2-TYPE is part of the poster exhibition alongside esteemed colleague from the world of graphic design and typography: Majid Abbasi, Paul Barnes, Peter Bilak, Matthew Carter, Simon Esterson, Vince Frost, Mark Gowing, Joost Grootens, Jianping He, Henrik Kubel, Zuzana Licko, Sascha Lobe, Ellen Lupton, Karel Martens, Ahn Sang-Soo, Gerwin Schmidt, Christian Schwartz, António Silveira Gomes, Erik Spiekermann, Astrid Stavro, Sumner Stone, Lucille Tenazas, Patrick Thomas and Rudy VanderLans. Kubel – himself a member of AGI since 2007 takes up the title and role as the 10th UK president after a long list of esteemed colleagues with an international reputation: FHK Henrion, Colin Forbes, Herbert Spencer, Mel Calman, David Hillman, George Hardie, Angus Hyland, Tony Brook and latest (outgoing president) Sean Perkins. Our typeface* won the prestigious 2018 TDC Prize from Tokyo Type Directors Club! *Designed with long-term collaborator extraordinaire Matt Willey from The New York Times Magazine. See more images from the project on our Commission Type page. The A2-TYPE #3 Specimen book + our Evening Standard Newspaper font system (see Commission Type) was also selected to feature in the Annual. Our work is featured (as new AGI members 2007) in this beautiful ground breaking book designed by Hesign International GmbH. The book is also using our fonts Grot12 Extended, Grot12 Normal and our latest release Schwiss for headlines, captions and all text matter! Watch video here! Purchase your own copy here! The book was published in September 2018 for the annual AGI, Alliance Graphique Internationale conference in Mexico. A selection of old favourites and brand new fonts from A2-TYPE in London. Published on the occassion of the AGI, Alliance Graphique Internationale Annual Members Conference in Mexico City, September 2018. A5 size, 128 pages, printed in 2 colours, exposed lay-flat binding. Edition of 500 copies. The specimen is featuring many new fonts such as A2 Record Gothic, Foundation Sans Condensed, Foundation Serif, Foundation Sans Wide, Foundation Serif Didot, Foundation Sans #44, Gothic Mono, Gothic Condensed, Gothic X Condensed, New Airport Dot (With Margaret Calvert), A23D Outline & a modern revival of one of the fathers of Danish type design; Gunnar Biilmann Petersen's classic Blokskrift from 1932: 'Biilmann'. Exclusively available to A2-TYPE customers, friends and good colleagues. The publication is designed by A2/SW/HK. A23D (Gold), Regular Slab (Silver), NYTM Sans (Silver), CNN Stencil (Silver), Moscow Sans (Silver), Register* (Merit), Grot12 Normal (Merit). View all awarded fonts with multiple project images here. Entries were scored by a panel of Judges, all award-winning Typeface Designers: Akira Kobayashi, Nadine Chahine, and Dan Rhatigan. Winning work will be published in the Graphis Typography 4 book. Order here. Typographic illustration 'Design is to Design a Design to produce a Design' for the article 'Problem Solved' by Alice Rawsthorn in the Intelligence section. Page 137–138. Commissioned by Art Director Jessica Rose. Eye 94 is using A2-TYPE's newly released fonts: English 1766 + Sunday Clarendon masterly and in great combinations throughout their superbly designed magazine. Hamish Muir and Paul McNeil of MuirMcNeil and Henrik Kubel (Sunday Clarendon + English 1766) from A2-TYPE will be talking about their contrasting approaches to type design, and the way their fonts are put to use in Eye 94. The evening will conclude with a panel discussion. All profits from ticket sales go to the St Bride Foundation. Event in the Bridewell Hall. Henrik Kubel is President of the jury comprising of esteemed designers Paula Troxler, Felix Pfäffli, Jaime Serra and Kurt Glänzer judging this years Brumen Design Awards. Kubel is also giving a lecture about A2/SW/HK + A2-TYPE's most recent projects. Title of lecture: A2-TYPE = WORK ! Henrik Kubel will present A2's Moscow Metro Custom font and Pictogram project* followed by an interview on stage by design legends Paula Scher and Michael Bierut from Pentagram's NYC office. A custom font in four grades plus a set of 40+ unique pictograms created exclusively for Moscow Department of Transport. Art directed and designed by A2–TYPE, Scott Williams & Henrik Kubel with Margaret Calvert as type and pictogram consultant. Cyrillic script designed in collaboration with Ilya Ruderman. Commissioned by City ID and Moscow Department of Transport, DOT. Margaret Calvert / A2-TYPE's New Rail Alphabet is featured in this fantastic exhibition. Curated by graphic designer Lucienne Roberts and design educator Rebecca Wright, founders of publishing house GraphicDesign&, with Shamita Sharmacharja at Wellcome Collection. June 1— September 5, 2017. This exhibition, curated by Gail Bichler, The New York Times Magazine’s Design Director, includes covers, spreads, and full special issues of the magazine. The focus is on typographic highlights since the 2015 redesign, including the magazine’s new typefaces and the thinking behind these faces. Also featured is some of the magazine’s most powerful imagery. The exhibition is free and open to the public Monday to Friday, 9 am to 4 pm by appointment only. Henrik Kubel from A2-TYPE will talk about the fonts we developed as part of Gail Bichler’s extended talk about the redesign of the magazine. Lecture date: 5 June, 2017. Sold out. Our work is featured in the exhibition 'Dansk Design Nu' - 'Danish Design Now' at Designmuseum Danmark + associated bumper publication [448pp] beautifully designed by Michael Jensen, K Grafik, available from Strandberg publishing. Henrik Kubel has been admitted to the prestigious Blue Book, 2016. This year's edition of Krak Blue Book contains 8,515, of which 253 newly admitted, biographies of the most important contemporary Danish, Faroese and Greenlandic women and men - people who are all helping to set the agenda in business, culture and public Denmark. A2-TYPE commissioned to design a special type only cover for Japanese design magazine 'Brain'. January 2017 issue FUTURE. The grid-based typeface was custom made for the publication. Lecture at Master Type Design Program @ éc a l in Lauserne, Switzerland, 7 December 2016. YES! Poster commissioned by The Chora Foundation to raise awareness of Clean water and sanitation. One of 17 United Nations sustainable development goals. The poster project was curated by Mervyn Kurlansky. Poster design by Henrik Kubel, A2/SW/HK featuring our New Grotesk Round fonts. We are featured with work + interview in this beautiful Japanese magazine, special type issue. A2-TYPE New Grotesk Square fonts are featured as one of fifty 'Best of 50 typefaces of 2015'. Book published by ATypI and etapes, November 2016. The publication also feature a great review of our 'New Perspectives on Typography' book is also printed in this impressive volume on all things type. Tokyo TDC 2017: We are proud to be part of the esteemed panel of judges: Katsumi Asaba, Kazunari Hattori, Naomi Hirabayashi, Tsuguya Inoue, Taeko Isu, Kaoru Kasai, Atsuki Kikuchi, Issay Kitagawa, Akira Kobayashi, Henrik Kubel, Gento Matsumoto, Kiyonori Muroga, Hideki Nakajima, Masayoshi Nakajo, Norio Nakamura, Yugo Nakamura, Yukimasa, Okumura, Takuya Onuki, Taku Satoh, Katsuhiko Shibuya, Shin Sobue, Fumio Tachibana, Yui Takada, Yoshie Watanabe and John Warwicker. Typeface award 2015: A2-TYPE custom fonts and Pictogram system for Moscow Metro. Commissioned by City ID and Moscow Department of Transport, DOT. Winner! of a Graphite Pencil in this years D&AD Global Awards Scheme. A sophisticated collection of typographic design, edited by A2/SW/HK, showcases more than 100 carefully selected contemporary designers, including the best examples of their current work, and also features an introduction by Rick Poynor and essays by acclaimed design writers Emily King, Paul Shaw, Monika Parrinder and Colin Davies that explore the past and future of type design. Featured designers include Michael Bierut, Experimental Jetset, Scott King, Cornel Windlin, Hort, karlssonwilker inc., Stefan Sagmeister, Fuel, Gavillet & Rust, De Designpolitie and Richard Turley among others. A2-TYPE was awarded the top award at this years LAUS Awards in the typeface design category for our New York Times Magazine suite of custom fonts. In addition to the type design award our design studio A2/SW/HK also received a gold award for design and art direction of International photography magazine Aperture. See all winners here. AGI Open, Seoul 24-25 September 2016. Henrik Kubel will be speaking about Moscow Metro custom fonts and pictogram system + The New York Times Magazine bespoke suite of fonts. Tokyo TDC Annual Awards 2016 Results. A2-TYPE custom fonts for The New York Times Magazine has been announced winner of the prestigious Grand Prix Award. YCN_Annual design competition. A nomination led design award programme. A2-TYPE are proud to receive this prestigious award for our suite of custom fonts for The New York Times Magazine. Read about the awards and see the other winners here: ycn.org. Henrik Kubel gave a talk in Barcelona at ELISAVA, Barcelona School of Design and Engineering. Kubel joined a long list of esteemed design practitioners and colleagues from around the world including Karel Martens, Tobias Frere-Jones, Sonya Dyakov, Mark Porter, Ken Garland and Natasha Jen. Henrik is giving a lecture: 28 November, 2015 at 14:00 at the Postgraduate, CAS Type Design course. Welcome to A2-Type Webfonts. We will supply the .woff webfont format for self hosting for all clients. Launching mid 2016. 4-page Interview by Peter Gyllan with Henrik Kubel of A2-TYPE in leading German design magazine Novum. 07.17. The Independent Newspaper, Moscow Metro signing fonts and The New York Times Magazine custom font commissions are discussed and featured in great detail. Sheffield Design Week 2015. Custom made sign for anniversary exhibition. This year’s event coincides with the 50th anniversary of the launch of Jock Kinnear and Margaret Calvert’s road signage system. To celebrate, Made North has commissioned 50 designers from Jonathan Barnbrook to Kubel, Spin, Mike Dempsey and Mark Bonner to create their own version of the road sign. Read more here. Typeface award 2014: A2-TYPE custom fonts for The Independent Newspaper and associated magazines. Winner! of a Yellow Pencil in this years D&AD Global Awards Scheme. Henrik Kubel has been appointed a member of the esteemed teaching team at Type@Paris. Wednesday 1st July: Henrik will be giving a talk about his type and design work. Further details and tickets. Henrik Kubel is speaking in Australia, Melbourne at http://ideasondesign.net conference, 2105. A workshop on type and lettering is also planned. Typeface Award: Tokyo TDC Annual Awards 2015. A2-TYPE custom fonts for The Independent Newspaper and associated magazines has been announced Winner of the prestigious Type Design Prize in Tokyo. Typeface Award: Tokyo TDC Annual Awards 2015. A2-TYPE’s A23D letterpress alphabet for New North Press has been awarded in this years annual competition. Watch the movie here! January 2015: Henrik Kubel has been awarded the prestigious KVE Award from Designmuseum Denmark. There will be an official reception 11 February 2015 at the museum in Copenhagen and a short presentation of Henrik’s type work. All welcome! The International Review of Graphic Design #79 Spring 2011 TYPE SPECIAL features our Typewriter font throughout the whole publication, headlines, pull quotes, text and captions. Check out Typewriter in 3 weights here. Made North Conference 18 June 2015. Invisible Design. Henrik Kubel is speaking about his work with Margaret Calvert: New Transport, New Rail Alphabet, Moscow Sans. Other speakers include Deyan Sudjic, Ben Terrett and Corin Mellor. Read more here. Our first commercial typeface. New Rail Alphabet was designed in collaboration with Margaret Calvert. Download New Rail Alphabet Specimen here. Our typefaces A2 Beckett, Danmark, London, Monday, New Rail Alphabet, Outsiders & Typewriter are all featured in Type Navigator – The Independent Foundries Handbook by Jan Middendorp & TwoPoints.net. September 10, 2011: Kubel is showing his Antwerp typeface(s)* as part of the ‘De magie van het letter-ontwerpen’ exhibition at the fantastic and very important Plantin-Moretus Museum in Belgium. Click here to read more. *Antwerp, a family of text faces especially crafted for publications will be available from A2-TYPE in five weights in late September. The face is also featured on the amazing eye magazine blog ‘Type Tuesday’ Click here to read more. About A2's Type design — By John walters, Eye No. 76. Paul Shaw picks his 5 favourite fonts from our collection. Typewriter Italics have finally been added to our Typewriter family of fonts. 3 weights available. Communication Arts. The Amplify Family; Light, Regular and Bold has been accepted into the prestigious Communication Arts 2014 Typography Annual. Henrik will be speaking about New Transport™ at this years ATYPI Type conference in Amsterdam. Sat 12 October at 11:25. Henrik will be speaking at Typo Berlin May, 2013. New fonts and projects! Our A23D typeface / letterpress alphabet has been honored with a 2015 New York Type Directors Club TYPEFACE DESIGN AWARD. Watch the movie here! BRASIL! Poster featuring A2 BRASIL alphabet designed (ripped out of an old brown envelope) by Henrik Kubel for AGI Special Project.This year’s poster exhibition will take place at a very special venue, the Museu da Língua Portuguesa (Museum of the Portuguese Language). Each member also commissioned a poster from a former student to be displayed alongside their own. Henrik Kubel choose Geetika Alok, taught by Kubel at Royal College of Art and collaborator on A2-TYPE Wallpaper* display font ‘INDIA’. Paul Shaw – Helvetica and the New York City Subway System. Lecture at Royal College of Art, 25 February at 14:30. Stevens Building, PAL 1st Floor. All welcome. Poster featuring a preview of our new font New Grotesk Five and Seven. Poster designed by A2/SW/HK. Henrik will give a lecture on recent fonts at TDC, Type Directors Club in NYC. The talk will focus on his work as a partner of London based design and typography studio A2/SW/HK + A2-TYPE – specifically the history of Transport Alphabet and Kubel’s close collaboration with Margaret Calvert on the design of New Transport™. Henrik will also discuss a recent Newspaper font project which the studio have just finished work on. Lecture is 7 November, 2013 at 6:30 at TDC. Type Tuesday: Henrik Kubel, ‘New work, new fonts, New Transport’ — Tuesday 4 June 2013 — Eye magazine hosts another informal evening for designers and typographers. A whole FOUR of our typefaces were selected as ‘Typefaces of 2011’ by typographica.org. Read the reviews here. Thank you to Stefan Hattenbach, Mark Simonson, Jügen Siebert and the lovely Marian Bantjes. Antwerp: 5 weights + Italics, A2 Beckett: 6 weights, Dane: 6 weights, Outsiders: 7 weights + Italics. All fonts have extended character sets. Eye Archive Night at ATypI 2013 Amsterdam. The guest speakers include designer Joost Grootens, Mathieu Lommen, Dutch design legend Irma Boom, Marina Chaccur, Experimental Jetset and type designer Henrik Kubel. The event will be chaired by Eye editor John L. Walter. CELEBRATE — TDC turns 65! A2-TYPE is featured on page 48. It’s a detail of an old 10 meter long wood sign from our private collection. The full sign reads: 48 COMMERCIAL MANUFACTURING GOWN LTD 48. We are VERY proud to announce our partnership with esteemed NYC based type foundry VILLAGE. Village will distribute our fonts in America and across Europe starting with our classic text face Antwerp! The ABCs of A2: An Interview with Henrik Kubel by Martin Salazar. Antwerp was selected for TOKYO TDC Awards Annual 2012 along with our typeface specimen which also won a Certificate of Typographic Excellence from Type Directors Club in NYC 2012. Henrik is giving 2 lectures in Switzerland next week: FHNW HGK Basel Visual Communication Institute in Basel, 9 November 2011 — and at the Syndicom Gewerkschaft Medien und Kommunikation conference in Bern, 12 November. Winner!!! New Rail Alphabet. Margaret Calvert & Henrik Kubel win prestigious type design award in ATyp2011 typeface competition ‘letter.2’ for their New Rail Alphabet font: www.newrailalphabet.co.uk. Check out the rest of the winners here: www.letter2.org. AGI Open Barcelona, 3–4 October 2011 — Henrik Kubel has been invited to speak. Other speakers include: Michael Bierut, Nicholas Blechman Irma Boom, Tony Brook, Kyle Cooper, William Drenttel, Mário Feliciano, Isidro Ferrer, James Goggin, Joost Grootens, Jessica Helfand, Steven Heller, Angus Hyland, Chip Kidd, Anette Lenz, Lars Müller, Javier Mariscal, Christoph Niemann, Stefan Sagmeister, Paul Sahre, Ahn Sang-Soo, Paula Scher, Pierre di Sciullo, jan Wilker & Marina Willer. Read more here. New Typeface specimen out now! July 2011. Beautifully printed in Riso by Ditto Press. Featuring typefaces such as our brand new text type family ‘Antwerp’ (preview only, to be released in Autumn 2011), Aveny-T now in 11 weights, Ergonomics and Boing to name a few. Making headlines for Wallpaper* Magazine ‘Reborn in India’ issue, June 2011. In collaboration with Geetika Alok we were commissioned to develop a headline display typeface in two weights for our favourite design / interiors / fashion / art / lifestyle magazine! Our typeface specimen wins prize at Type Directors Club in New York 2011. Henrik Kubel is speaking in Japan, Tokyo at the prestigious Type Directors Club at Design Forum ‘TDC DAY’. 6 hours marathon forum by prize winners and guest speakers. 12:30–6:30pm, Sunday, April 5. Venue: 1F Hall, DNP Gotanda Bldg. 3-5-20 Nishi-Gotanda, Shinagawa-ku, Tokyo 141-8001 Reservation required, first-come first-served basis. Booking and Inquires: info@tdctokyo.org. Commissioned poster (featuring A2’s New Grotesk Round ONE typeface) for UK based illustrator Paul Davis’ exhibition at Ginza Graphic Gallery, Tokyo, February 2015. 20 of Paul’s friends were asked to design a poster for his show. The poster measures 1030 × 728mm and will be displayed in the gallery. Photography by Katherine Rose. Assisted by Emily Robertson. Quote by Adrian Shaughnessy. The Danish Agency for Higher Education has appointed Henrik Kubel as external examiner for assessments at The Royal Danish Academy of Fine Arts, School of Architecture; The Kolding School of Design; and the Aarhus School of Architecture. Kubel will hold the position until 2018. Our Amplify brand typeface has been honored with a New York Type Directors Club TYPEFACE DESIGN AWARD. The Amplify fonts are based on our Outsiders font. The project was art directed by Graham Clifford and Co Collective in New York. John Morgan has chosen New Transport as part of PANORAMA — A landscape of graphic works from 2012 May 25 / June 10 24th International Poster and Graphic design Festival of Chaumont in France. Henrik will be speaking at SVA, School of Visual Arts in New York City at the end of February. New fonts and design commissions will be discussed in his lecture. New Grotesk font is used on the front cover of The New York Times Book Review. Illustration by: A2/SW/HK. 29 March, 2012. The Typographic Circle: Bruno Maag, Freda Sack, Henrik Kubel, Phil Baines and Simon Dixon will each give a short introduction on what inspires them, followed by a lively and informative debate with questions from the audience. Graphic Design: Now in Production, Walker Art Center, October 22, 2011 — January 22, 2012 + Cooper-Hewitt, National Design Museum, New York, June — October, 2012. Our Slab serif typeface for text; FM (5 weights + Italics) + Specimen has been selected for this great exhibition curated by Ellen Lupton, Ian Albinson, Andrew Blauvelt, Jeremy Leslie, Armin Vit and Bryony Gomez-Palacio. Read more. A2-TYPE is selected as part of Top 10 Typographic Events of 2010. Recently, I profiled the new type foundry A2-Type, a venture of Henrik Kubel and Scott Williams of the design firm A2/SW/HK on this site. Since then, they have teamed up with Playtype.com to release more than 30 more fonts. Its debut is the strongest of the year… Read more plus the rest of the top 10.